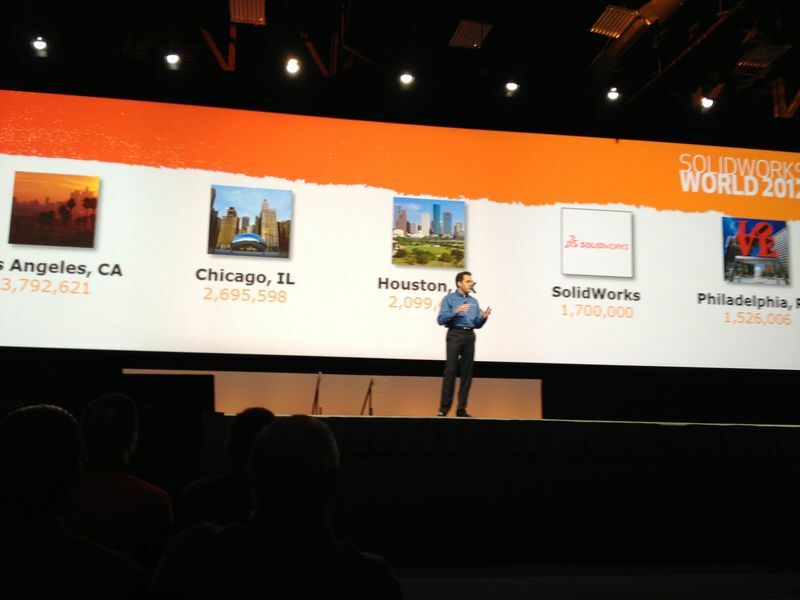 The first general session of SolidWorks World 2012 ended just a little while ago, and there’s a lot to talk about. We should have some video for you a little later this afternoon, but for now, here’s a quick recap of what went on here in San Diego this morning. 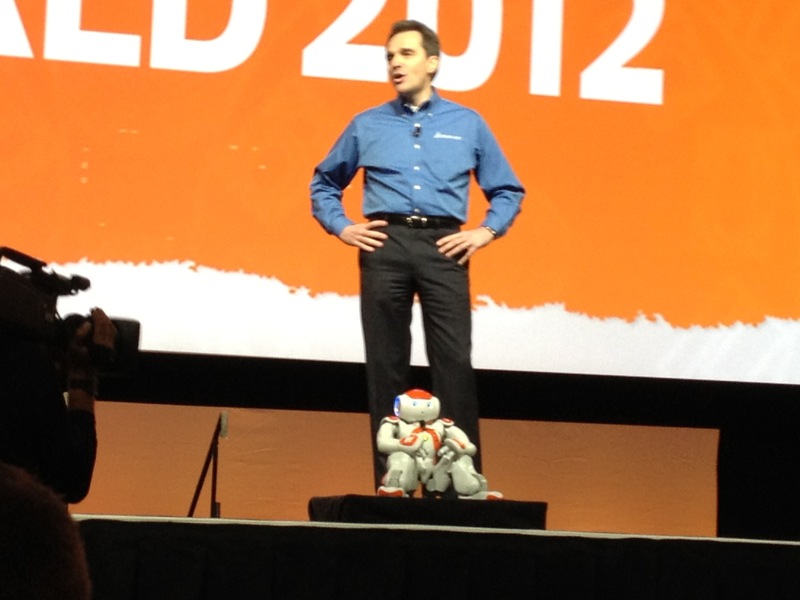 CEO Bertrand Sicot was introduced by a Nao robot from Aldebaran, and started out talking about the size of the SolidWorks community, which has reached 1.7 million members. To put that into perspective, if all of those users formed a new city, it would be the 5th largest in U.S.—larger than Philadelphia. If all 1.7M users formed a new country, it would rank #150 in size out of 235 countries existing today. That’s a lot of people. Bertrand went on to talk about how everyone in the SolidWorks community is united by the concept of design, with product design being a constant in all aspects f our lives. He used Dan Herzberg as an example. If you don’t know Dan, he learned SolidWorks at WPI, interned at SolidWorks in 2009, and is now professional engineer and SolidWorks user group leader in Virginia. Last year, Dan had surgery to replace a defective valve in his heart. Before the surgery, Dan learned that the valve being implanted in his body was made by On-X Life Technologies, a new SolidWorks customer. Most people with artificial heart valves spend the rest of their lives taking blood thinning medication. But the team at On-X has paid a lot of attention to the way the blood flows, and they believe their unique design will reduce or completely eliminate the need for blood thinners in the near future. Today marks six months since Dan’s surgery, and he joined us in the audience.This is an amazing example of one user’s life being saved by another user’s design. Shortly after, the first guest of the day came out to talk—Mike Rowe from Discovery’s Dirty Jobs. Mike talked about the growing skills gap in the US, and focused heavily on the need for education in trades. Stay tuned for a special interview with Mike later today. Bertrand came back to talk about the role if innovation at SolidWorks, highlighting the R&D team and the ways that they remain focused on SolidWorks’ core principle of focusing on the end user. He also announced that we recently reached a new milestone of 50,000 Certified SolidWorks Associates, Professionals and Experts. We were also joined by Dassault Systèmes CEO Bernard Charles, as well as Dr. Maia Hoeberechts from NEPTUNE Canada. NEPTUNE is the world’s first underwater observatory network. It includes more than 130 instruments and 400 sensors in the northern Pacific, linked by over 500 miles of cable—all connected to the Internet and constantly collecting data. This data is available freely to a community of researchers around the world, twenty-four hours a day. 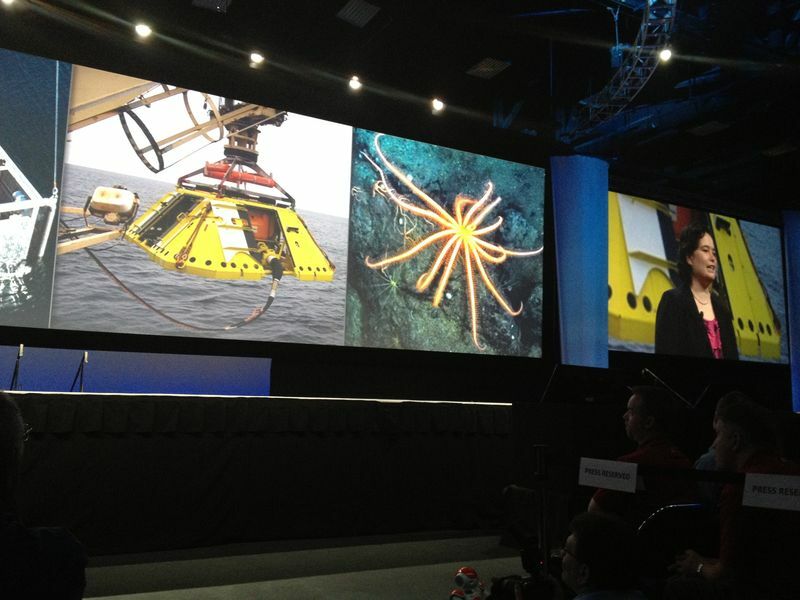 The public can also take part and make discoveries, and this combination of professional and hobbyist research is leading to new insights about the ways in which our oceans work. 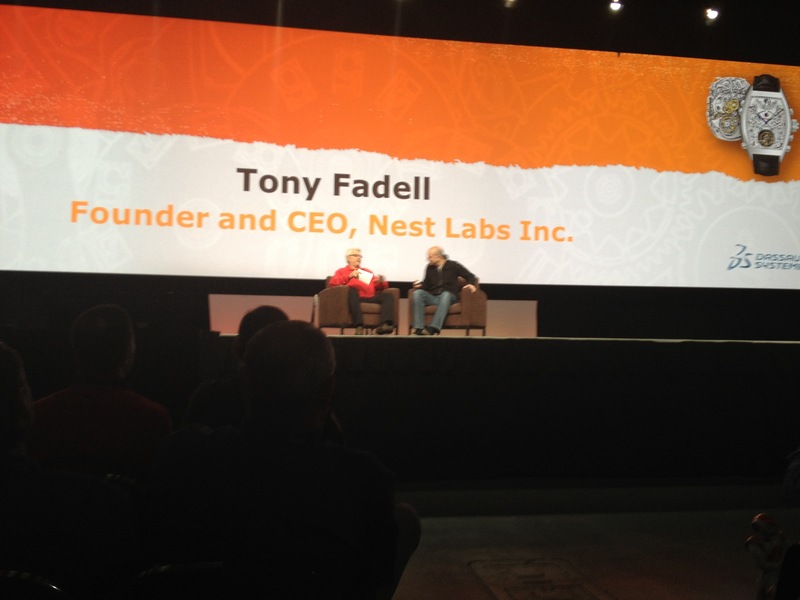 The session ended with a keynote presentation from Tony Fadell, considered by some to be “the father of the iPod.” Tony talked about the early days of designing the iPod and arguments with Steve Jobs over Windows compatibilty, and also focused heavily on the challenges of managing a global 100-person start-up. He also talked about the process of founding his new company, Nest, and how they went about designing and selling the world's first learning thermostat. Well, that’s it for today. 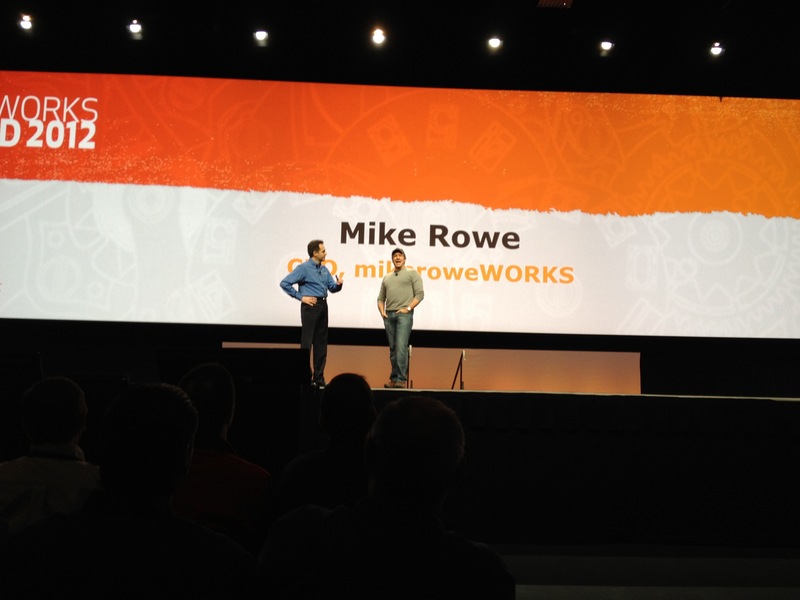 Check back later for the Mike Rowe interview and session video. See you tomorrow!